Sheela, Lindsay and Stacy (left to right) at the West County Detention Center, Richmond, CA. The phrase has stuck with me, because it expresses the deep connection between people—how much we depend on each other, are shaped by each other, and need each other. I believe that all human beings are deeply connected. But there is a different story being told in our nation, one that encourages us to believe we are so different and separate from each other that some of us belong and some of us do not. It’s a story that claims that I must take care of myself by myself, and you have to do the same alone. Today, an extreme version of this story is stoking hatred and violence against women, immigrants, people with disabilities, gender non-conforming people, people of color, and Jewish people. I believe that recognizing how much we need each other is what will truly transform our times and shift us towards communities that care about our individual and collective well-being. So, how have we been creating caring communities at Hand in Hand this year? From California to Seattle to Washington DC, Hand in Hand members inspired legislators to understand the value of domestic workers’ contributions to our communities. For example, we joined with domestic workers to support the passage of the Seattle Domestic Worker Ordinance, the first municipal law of its kind. A big deal! In New York and the Bay Area, we also urged lawmakers to provide access to long-term and in-home care. Together with the NY Caring Majority coalition, we succeeded in amending the New York Health Act to include long-term care! We organized 65 parent-and-child ‘protest playdates’ in over 30 cities to lift up the voices of domestic employers and families. We showed our care by organizing “a caravan” to the border to protest mass arrests of migrants, and showed up at Chase and Wells Fargo bank branches to connect their heartless investments in detention centers to the thousands of children who have been torn from their parents at the border. On staff, we are happy to be joined by Suzanne Schmidt, as our new organizer in California; Diana Morales, our Administrative and Operations Manager; Tara Polansky as our Digital Organizer; and I joined in June as the Network Director! Our National Steering Committee also has expanded from three extraordinary, founding members—Gayle Kirshenbaum, Jessica Lehman, and Betsey McGee—to a crew of 16 people across the country, each caring community organizers in their own right. And our membership and online network are growing, with over 4,000 people on our list, and on the ground groups in New York, the Bay Area, Philadelphia, and Columbus, OH. Will you become a member today by contributing an amount that is meaningful to you? Click Here. Your support has enabled us to inspire thousands of people to build communities that care—care about workers, about families, about seniors and people with disabilities, and about immigrant communities—who are working to make change in their homes, communities and at the government level. With your continued support, Hand in Hand will be able to deepen our impact in 2019. Stand together with immigrant and other targeted communities to ensure safety, dignity and respect for all through our Sanctuary Homes campaign. Will you become a sustaining member and contribute a monthly donation of $10, $20, $50, $100 or an amount that is meaningful to you? Click Here! Your dollars become hours that our organizers spend working in communities. They become workshops, resources, vital campaign tools, and an ever-expanding community of people working for a more just and caring society. When you support Hand in Hand, you are joining a powerful grassroots movement of people who know that domestic work makes all other work possible, and that we all need care and support to thrive. Join us today: Building caring communities will require all of us. P.S. Check out our photo-filled Hand Year in Review here! We at Hand in Hand are grieving along with the communities that have lost family and friends this past week, and we send our promise to continue to work for a society free from violence, where we value our interdependence and acknowledge the ways we need each other and belong together. In the last two weeks, many have been impacted by the hate-driven rhetoric and policies of our government. The administration has announced plans to deny civil rights protections to transgender Americans. They continue to stir up hatred towards the group of Central American people - adults and children - legally seeking asylum and safety from violence in their home countries. This past week, our country experienced more horrific violence with the hate-driven murders of 11 Jewish people at the Tree of Life Synagogue in Pittsburgh and 2 African Americans in Kentucky. Since our founding, Hand in Hand has been committed to bringing people together, to work to meet our common needs for support, dignity, and respect. As employers of domestic workers and allies, we keep supporting one another to take actions that transform the history of exclusion, exploitation, and devaluation of immigrant and women of color domestic workers. We fight for dignity and respect for seniors, people with disabilities, and families, by campaigning to ensure our access to affordable long-term care. We fight for respect and dignity in the home workplace and for the immigrant and refugee communities many domestic workers come from. Our Sanctuary Homes campaign works to end policies that dehumanize Muslims and people of color, separate families, and detain people who are seeking protection and asylum. We have seen what change is possible. We know through the actions we take at home and the work we do together in our society, we can increase the amount of dignity and respect in the world. We thank our members and supporters for your tireless work to create a world that values all of us, where we all get our needs met, and are free from hate-motivated violence. We are grateful to be in community with you. We continue to insist that none of us survives without support and that we all live better together. We insist on dignity. We demand safety. And we will keep building communities, cities, states, and a nation that put these values into action. We invite you to honor the lives lost by holding your loved ones close and being kind to yourself, so that we can, moving forward, continue to work for our vision of caring communities. Lisa Nakamura is a clinical psychologist, a mother of two kids, and a third-generation Japanese-American whose family was incarcerated during World War II. She’s also a longtime activist in the Asian American community who has supported immigrant rights and racial justice and lives and works in the San Francisco Bay Area. I spoke to Lisa to get her advice on how parents can talk to children about the current attacks on immigrant communities. What is important about talking about current attacks on immigrants with our children? Children do best when they can connect to an issue through their everyday lives. In this case, it’s important for my children to know what is happening in our community and how it’s affecting their neighbors, friends, and their families. But we also have to take into account what developmental stage they are in and how much details of this issue can they emotionally manage. What have you shared with your own children? My daughter just started third grade, and my son is starting middle school. I think it’s important to connect one’s own immigrant history in their family with the current-day issues. We can share what factors lead to a relative to leave their own home country and community to immigrate here and what was stressful about the move. I’ve talked to my kids about the history of Japanese immigrant and Japanese American incarceration as a way to understand what is happening today to migrants being detained at the border. Under this current political moment, I told them how kids were separated from their parents when they arrived at the border and treated unfairly. I explained to them that, much like what happened to their grandparents’ families, the government has been stirring up fear and racism. How can you help kids be respectful of differing opinions but firm in their own beliefs? We can tell children how adults have a hard time respecting different ideas, particularly in the very divided times we live in. We can model how to express disagreements in our own family while still respecting each other. We can practice how to truly listen and try to understand the other point of view, even if we disagree with it. Doing so would enable us to go beyond just asserting our stances in an argument, but engaging in a dialogue. Of course, I still encourage them to speak out for what they believe in. What questions might they ask you that could be difficult? 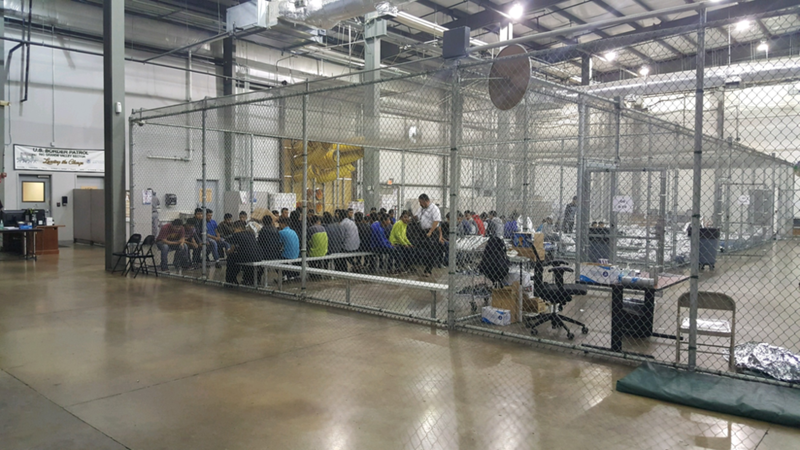 Some children might fear, in hearing this story, that this could happen to them -- that they could be taken away from their parents. Especially for children who have a lot of difficulty separating from their parents, it’s important to emphasize that this won’t happen to them. Children also need a space to express their emotions about these issues. And they do it in different ways from adults. To help them articulate their feelings, you can write a list of feelings down and and ask them to choose what they are experiencing. You could encourage them to write a letter or draw a picture to express their feelings and ideas. Some children may ask why the government is doing this. I think it’s important to explain that it has happened before to groups of people because of fear and ignorance. You can tell them what other children and adults are doing to help. They can appreciate that they are part of a larger community of people and children who stand up to the government as well. Stacy Kono is Hand in Hand's Network Director. If you want to engage with your children in taking positive action after talking to them, you can have them www.mysanctuaryhome.us/playdate-coloring. We'll get it to them. I’m having trouble sleeping at night. How can I sleep when children are being traumatized, waiting for parents who may never come? Join me by writing a letter to detained children, letting them know that millions of us are thinking of them and fighting for their freedom and their families. Send a photo or scan of your handwritten, typed, or decorated letter to info@domesticemployers.org, or take a photo and post it to social media with the hashtag #letterstochildren so we can find it. Hand in Hand will coordinate delivering these letters to children in detention. As a social worker I know that a sudden, unexplained separation from a loved one is traumatic to a child. It’s torture. There is no hugging, no playing, no solace, no comfort in many of these detention centers. Now we are learning of forced drugging of children in detention, physical abuse, and neglect. Let us be at least one more voice saying to these children: I’m with you; I care about you; I am doing what I can to help free you. I have marched, signed petitions, donated money and gone to sleep and woken up thinking of these children, these parents tortured by our government, on our watch. We need to keep doing all of those things. Now I’m also writing them letters, as a way to let these children know the bottom of my heart that they will soon be free and with their families again. And I’m asking you to send one also. (See examples from social media here.) Type it, write it, draw it, or make colorful ones with your kids using these printable coloring pages.